Joel Robuchon is dead. I never ate in one of his multi-Michelin starred restaurants. But, like any food-minded person, his influence has made itself known. He was perhaps most famous for his Pommes Puree. Mashed potatoes by any other name. 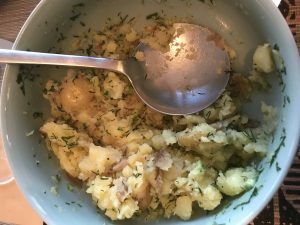 These potatoes, made with an ungodly amount of butter, were whipped, fluffed and smoothed then run through various sieves and meshes to achieve a consistency and uniformity of…of…I don’t know…Velvet? Buttered velvet? Apparently the dish was so rich that a tiny serving was enough to satisfy. It is often described as the culinary pinnacle of the potato — the highest heights of the spud. My aunt and uncle have a farm located about 30 minutes from our house. My uncle, raised on one of the older kibbutz in the Golan Heights, grew bananas and other crops as a youth. Later he was a paratrooper during the fierce fighting of the 60s and 70s. Even later he worked in the Denver school system teaching special needs kids while maintaining a second career as a cantor and master equestrian. He has returned to his agricultural roots in Prince Edward Island growing sweet garlic, mounds of lettuce, gigantic pumpkins, peppers, tomatoes, kale, lavender, squash, beans and…potatoes. During summer, we often drive over to the farm for a visit. We pull hard shell clams from nearby St. Mary’s Bay while my daughter and son paddle-board in the calm waters. From the farm we fill paper bags with whatever is in season: sour cherries, black currants, blackberries; we snip a bunch of zucchini blossoms and handfuls of oregano. My son is charge of potatoes — he likes the “digging for treasure” vibe of plunging a shovel into the soil and seeing what it offers up — eventually bagging a dozen or so yellow and red beauties. Back at our house, no matter what the main protein was for dinner, I boiled those potatoes with the skin on. When a knife easily slid in and out, I tossed them in a mixing bowl with a tablespoon or two of butter, a spoonful or two of sour cream and a lot of good, peppery olive oil. I would chop up whatever herbs we had (parsley, dill, chives, basil) and perhaps some garlic scapes or shallots and toss it into the bowl with salt and ground white pepper. Then I would smash them. Not mash. An in-between state that gave equal weight to creaminess and the integrity of the tuber’s flesh. It was an un-adorned, ugly dish requiring zero culinary technique. It sang of Prince Edward Island, of summer days and cool nights; of the specificity of soil, of calloused hands and bruised knees and bee stings; simple pleasures and the enormous and often unlikely journeys we all make as individuals in a world so historically complex. Robuchon’s Pommes Puree got nothing on my taters.